Find the right tour for you through Swansea. We've got 5 tours going to Swansea, starting from just 4 days in length, and the longest tour is 8 days. The most popular month to go is April, which has the most number of tour departures. "I had a fantastic time on the tour. 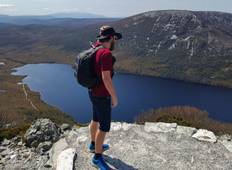 Tasmania is beautiful!! The memories of the people..."
"Great tour, just wish would stay a bit longer at each spot for enjoy more." "Well balanced tour with emphasis on eco-tourism with natural scenery, wildlife and..."